She has worked in France, Switzerland and the USA. These are the main steps in her long career, the experience she has acquired with time thanks to her passion, commitment and dedication. Orietta is a young woman, with a young, lively and smart look. She was born in the Marche region, in Morrovalle, in the Macerata area. She has studied to become an accountant, but she soon learned that her life was not maths and sums, but gastronomy and the culinary art. This is for Orietta pure art, in which aesthetic taste, creativity and technique merge together - All of which is possible by starting from often simple ingredients. Meeting Gualtiero Marchesi changed the course of her life- as Marchesi's school, is not only a cooking school, but also a school of life. The Chef is a very intelligent man, with a great knowledge, a prodigy who is open to suggestions from his colleagues and who is available to listen to innovative suggestions to improve his work. The knowledge Orietta has acquired during her internship in Milan, opened a whole new world for her- where high standard cuisine is openly available. Milan, Zurich and Paris have been fundamental steps in her career that gave her the chance to attend classes with some of the greatest Chefs, including Joel Robuchon, Alain Senderens and Dominic Lestanc- the last one being considered the "Marchesi of the French Riviera". At this stage, Orietta had become famous. 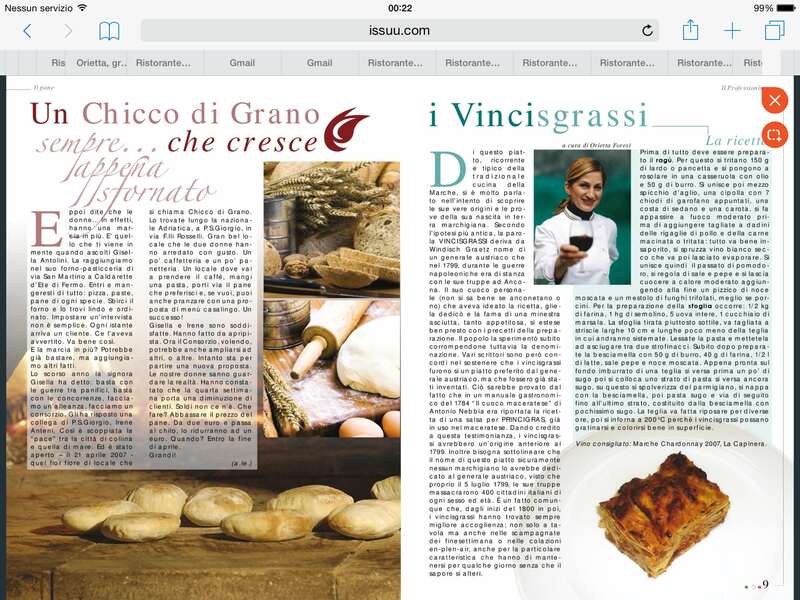 In 1992, the publishing house "Fabbri Editrice" offered her to write some recipes (36) for creative regional cooking. Soon after she left for the United States, New York City, thanks to the sponsors Varnelli, a famous liquor company, and Spinosi di Campofilone, a well-known company for the production of pasta "Maccheroncini". She remained in New York for 2 weeks, only cooking her specialties in many different Italian-American restaurants. She cooked savoury dishes by using a special ingredient, Varnelli Mistra' (Anisette). Once she had returned to Italy, she was contacted again from the United States, from the Culinary Institute of Brooklyn, where she has attended a festival of Italian regional cuisine. She has won the first prize with her revisited and improved recipe for "Coniglio in Porchetta" (Rabbit in Porchetta). In the big kitchens of the University there were some of the best Italian restaurants of New York, and next to them, directly from Italy, there was Orietta Foresi- from the restaurant "Il Castro" of Morrovalle, in the Macerata area. This initiative, unique in its kind for the City University of New York, represented this professionalism and reliability which Orietta believes are important. The following years, she has worked as a Ched in Macerata, in the renowned restaurant "Da Secondo", where worldwide celebrities go. She has worked there for many years. Her arrival at "MedEATerraneo" is recent. This is a short summary of Orietta Foresi's career- who is very active in the business and she takes part in numerous cultural-culinary initiatives. A few years ago, she has won a competition in Gubbio, the "Tartufo d'argento" (The silver truffle) with a terrine of sole, salmon, pistachios and white truffle of Gubbio. Trustee of the "Arcigola Slow Food" for Macerata, she has organized important events with numerous celebrities in attendance. If for some life starts when they are 50, for Orietta Foresi you can say it started again recently at "MedEATerraneo" in Civitanove Marche- a restaurant of excellence, which combines good food and the possibility to see the Chef at work - the kitchen is an open-plan - it is the stage where the Chef "performs" the realisation of her dishes.